1. Green Open Front Cardigan I have a really similar cardigan in maroon that I wear to work a lot, so I thought this would be a great addition to my wardrobe. Plus, it's my favorite color! I bought it with a gift card I had been hoarding since summer. I got it for $22.99 but it's currently on sale for $13.79. 2. Toms Wedges Yes, Sandals. I can't wear them until next year, but I found them for a great price at a local shop ($29) and I thought they would be a great replacement for my favorite Old Navy wedges (worn here) that finally died. I was so bummed when the strap broke, but I figured it was a good time to invest in a nicer pair that hopefully won't break. Also, I am 6 feet tall in these. I haven't decided if that is a positive or a negative, but you know, I'm mentioning it. 3. Denim Leggings This is the only thing I bought on Black Friday (online! In-store Black Friday shopping is my worst nightmare). I actually haven't received them yet, so we'll see if I like them. These were ordered as a replacement for a pair of jeggings that I love that are slowly starting to get holes in them. They were $16.99. 4. Necklace/Earring Set We recently got a Charming Charlie in town, so I went to "check it out." I ended up buying this set for $6.99. I don't really have any reason to be honest. It was totally one of those "eh, it's on sale purchases." Anyway, I feel pretty confident that I will get a lot of wear out of it, so hopefully I won't regret it. I am honestly not that impressed with how much I spent, just because it is so close to Christmas. I usually try to cut back during holiday months since we spend more on gifts. Here's to being frugal in December! Those Toms wedges are so cute! those wedges are adorable. So smart to get them off season, especially since you know you already wear something similar! Love the wedges! And the first thing I thought when I saw the sweater was how great you look in green! That cardigan is just lovely! 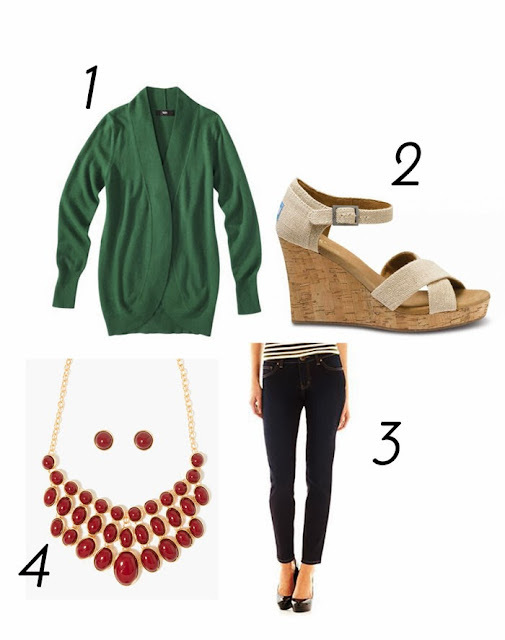 Love the cardigan and the necklace :D And winter is a good time to stock up on summer shoes! I love that green open-face cardigan! Great job on the budget!!!!! Love that necklace - and even better that it has matching earrings! Yeah, those wedges are super cute and I bet you will wear them a lot in the summer. I'm not a big fan of the "normal" toms, but they sure have some cute wedges! The wedges are so cute! I bet they will be so comfortable, too. 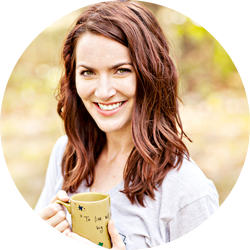 Love the color of your cardigan and I bet you will get lots of use from your jewelry! It is so difficult trying to cut back during pre-Christmas isn't it? There's lots of sales going around at the moment, and some of the discounts are just remarkable. I'm trying to be good and wait for after Christmas sales, because they're so much better! Though I guess I don't really need anything and shouldn't buy... eeeek! But I'm going to face the music, I KNOW I'm going to go shopping on the 26th. You forgot about your awesome anthro looking necklace from Versona! !